Get a taste of the basics in paraglider piloting : now you grab the controls! Fly tandem with Caroline or Gaby, our women champions! This is your first true leap into the great blue yonder… To fly with someone will, of course, feel very reassuring! 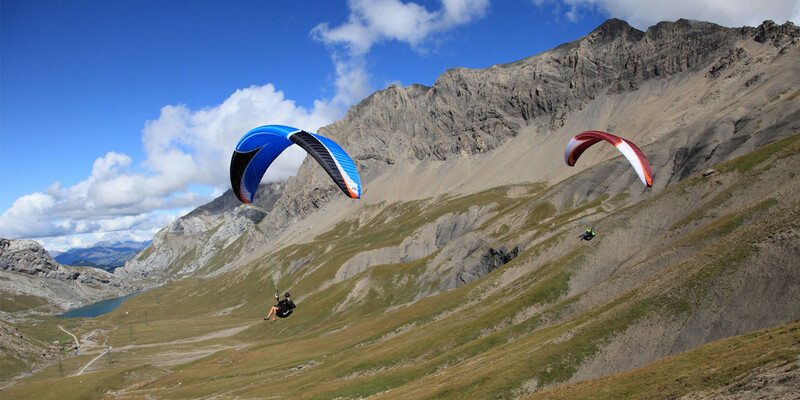 Tandem paragliding is what come the closest to actually flying like a bird, the easiest and most accessible way to do so. Thanks to our experienced instructors, you’ll discover a whole new state of wellbeing, immersed in a gentle world of beauty and delight. 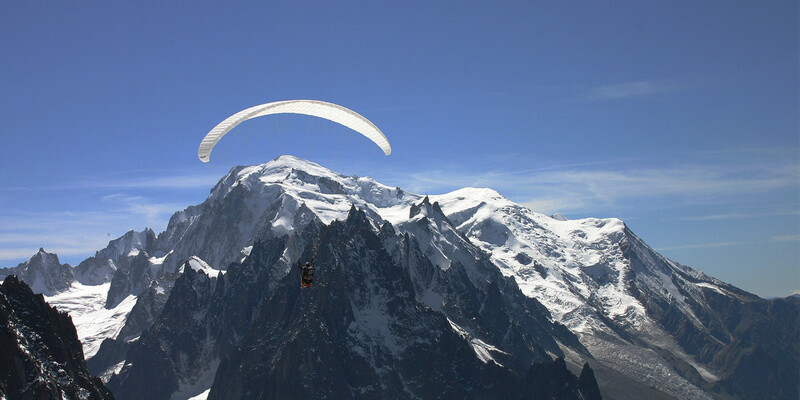 On the ground as in the air, their patience and guidance will have you thoroughly appreciate those precious moments in the heart of the Chamonix valley. Your instructor will strive to offer you the flight you wished for, the flight to please you: a calm and contemplative discovery flight, or one with a bit of action and thrills, or how about a pedagogical flight! You will get the flight best fitted to you. Of course, the duration of the fly can vary depending on the aerological conditions and the chosen site. 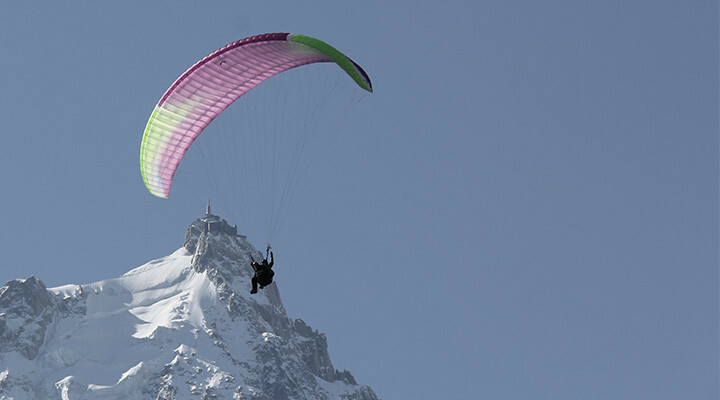 We proudly own the « Label de Quality » from the Fédération Française de Parapente and all our wings are equipped with reserve parachutes and airbags. Our instructors are qualified, certified and insured. Remember, our instructors fly with you. They hold their safety as well as yours very dear and all have families of their own. They will keep you safe. If they’re all for it, we can take kids up from the age of 4; but only in good conditions. That is in calm air and early in the morning. For seniors, a few additional precautions are taken to insure their wellbeing. We will modify the schedule to facilitate takeoff. The tandem record is held by a 104-year-old woman! 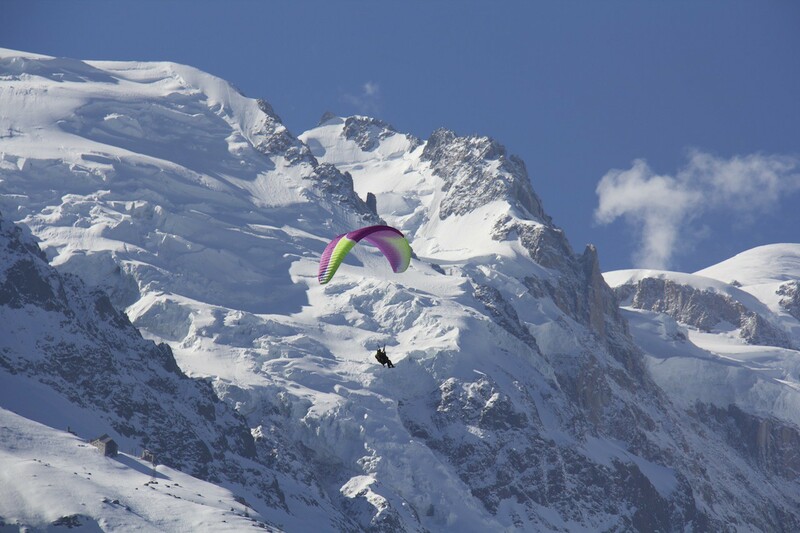 A discovery flight at Absolute Chamonix, nothing’s easier! You will meet with your instructor at the cable-car station. Plan on arriving a bit early so to buy your cable-car ticket in advance. After meeting with your instructor, you will both get up and use that time to get to know each other and prepare your flight. He will then guide you on foot to the takeoff site where he will get you all equipped. You will then prep the wing together and once he is done checking everything and has strapped you in, he’ll ask you to engage in a gentle run. You will immediately feel yourself getting lighter and soon after being taken by the gentle magic of takeoff, you’ll cradle in your harness, wholly supported by this beautiful wing above your head. And there, gently floating above the « merely humans », you’ll simply need enjoy the flight… But enough for now, we’re not going to spoil the fun by telling you everything right away! We will land close to the town centre and drive you back to the meeting point.